FUMBLES: STEELERS-None. ROOSTERS-Connette B 3-3. 20 Hayden D 10 6 13.0 2.0/6 . 1-0 . . . . .
6 Bell J 6 1 6.5 . 1 . . 1 . . .
3 Aspinen M 2 3 3.5 . . . . . . . .
26 Uotila A 3 . 3.0 . . . . 3 . . .
23 Inkinen S 2 2 3.0 . . . . . . . .
42 Makinen J 2 1 2.5 . . . . . . . .
99 Lindqvist J 2 . 2.0 . . . . . . . .
35 Pekkarinen I 2 . 2.0 . . . . 1 . . .
8 Vaisanen J 2 . 2.0 1.0/3 1 . . . . . .
9 Wort C 1 2 2.0 . . 1-0 . . . . .
77 Tanninen K . 4 2.0 . . . . . . . .
29 Ojala L 1 1 1.5 . . . . . . . .
90 Kauppinen M 1 . 1.0 . . . . . . . .
52 Tuppurainen T 1 . 1.0 . . . . . . . .
10 Hartikainen T 1 . 1.0 . . . . . . . .
65 Ojansivu N 1 . 1.0 . . . . . . . .
21 Ojainvali M 1 . 1.0 . . . . . . . .
92 Ntwa F 1 . 1.0 1.0/4 . . . . . . .
36 Luukkonen K . 2 1.0 . . . . . . . .
72 Peltonen J-P . 1 0.5 . . . . . . . .
12 Vilpponen P . 1 0.5 . . . . . . . .
13 Kuosmanen S . . . . . 1-0 . . . . .
2 Slater C 5 1 5.5 1.0/11 . . 1-36 . . . .
5 Olin A 5 . 5.0 1.0/1 . . . 2 . . .
61 Vesterinen E 4 2 5.0 1.0/12 . . . . . . .
3 Toivonen S 4 1 4.5 . . . . . . . .
90 Outinen O 3 1 3.5 . . . . . . . .
43 Ayravainen S 1 4 3.0 . . . . 2 . . .
81 Ahonen T 2 . 2.0 . . . . . . . .
28 Lempinen V 2 . 2.0 . . . . 1 . . .
22 Persson M 2 . 2.0 . . . . 2 . . .
8 Kuikka N 1 2 2.0 1.0/2 . . 1-0 . . . .
44 Berg C 1 2 2.0 0.5/0 . . . . . . .
48 Vartiainen A 1 . 1.0 . . . . . . . .
77 Lesonen H . 2 1.0 0.5/1 . . . . . . .
21 Davis W . 1 0.5 . . . . . . . .
39 Lievonen Mi . 1 0.5 . . . . . . . .
40 Redin I . 1 0.5 . . . . . . . .
99 Rautiainen J . 1 0.5 . . . . . . . .
32 Linnainmaa K . 1 0.5 . . . . . . . .
STEELERS: 2-Borgmann A, 10-Hartikainen T, 12-Vilpponen P, 13-Kuosmanen S, 17-Kuipers O, 21-Ojainvali M, 27-Paananen J, 29-Ojala L, 30-Ukkonen K, 36-Luukkonen K, 40-Eskelinen I, 42-Makinen J, 50-Vilhunen M, 52-Tuppurainen T, 53-Vehomaki E, 67-Ovaskainen S, 72-Peltonen J-P, 80-Perakorpi A, 86-Hovinen S, 89-Keranen K, 91-Kosonen P, 98-Ruotsalainen L.
ROOSTERS: 4-Tuovinen E, 7-Kadmiry M, 10-Saarijarvi K, 12-Vaananen H, 15-Jussila H, 18-Karhinen V, 20-Paavilainen V, 21-Davis W, 25-Lahtinen A, 27-Daifi M, 29-Rontu V, 31-Aarresuo V, 36-Kuronen A, 38-Raatikainen J, 39-Lievonen Mi, 40-Redin I, 44-Berg C, 48-Vartiainen A, 52-Huovinen J, 55-Kankaanpaa L, 58-Ilmela D, 60-Tyynila V, 74-Kantola O, 99-Rautiainen J.
Roosters voittaa kolikonheiton ja potkaisee. Ste 1-10 at Ste35 ROO ball on ROO35. Olin A kickoff 43 yards to the STE22, out-of-bounds, STE ball on STE35. Ste 1-10 at Ste35 STEELERS drive start at 12:00. Ste 1-10 at Ste35 Bell J rush for 4 yards to the STE39 (Toivonen S). Ste 2-6 at Ste39 Peters S pass incomplete. Ste 3-6 at Ste39 Bell J rush for 21 yards to the ROO40, 1ST DOWN STE (Olin A). Ste 1-10 at Roo40 Peters S pass complete to Jauhiainen J for 9 yards to the ROO31 (Olin A). Ste 2-1 at Roo31 Peters S rush for 4 yards to the ROO27, 1ST DOWN STE (Vesterinen E). Ste 1-10 at Roo27 Peters S pass incomplete to Wort C (Olin A). Ste 2-10 at Roo27 Bell J rush for 4 yards to the ROO23 (Vesterinen E). Ste 3-6 at Roo23 Bell J rush for 5 yards to the ROO18 (Ayravainen S). Ste 4-1 at Roo18 Bell J rush for 2 yards to the ROO16, 1ST DOWN STE (Toivonen S). Ste 1-10 at Roo16 Peters S pass complete to Bell J for 1 yard to the ROO15 (Slater C). Ste 2-9 at Roo15 Peters S pass incomplete to Jauhiainen J.
Ste 3-9 at Roo15 Hayden D rush for no gain to the ROO15 (Ahonen T). Ste 4-9 at Roo15 Timeout STEELERS, clock 07:48. Ste 4-9 at Roo15 Peters S pass complete to Ndongo T for 15 yards to the ROO0, 1ST DOWN STE, TOUCHDOWN, clock 07:43. Ojainvali M kick attempt good. Ojainvali M kickoff 49 yards to the ROO16, Connette A return 20 yards to the ROO36 (Vaisanen J). Roo 1-10 at Roo36 ROOSTERS drive start at 07:37. Roo 1-10 at Roo36 Connette B pass incomplete to Linnainmaa K.
Roo 2-10 at Roo36 Pajarinen K rush for 14 yards to the 50 yardline, 1ST DOWN ROO (Wort C;Bell J). Roo 1-10 at Roo50 Connette B rush for 33 yards to the STE17, 1ST DOWN ROO (Bell J). Roo 1-10 at Ste17 Pajarinen K rush for 5 yards to the STE12 (Kauppinen M). Roo 2-5 at Ste12 Connette B pass incomplete to Pinta T (Uotila A). Roo 3-5 at Ste12 Connette B rush for 12 yards to the STE0, 1ST DOWN ROO, TOUCHDOWN, clock 06:11. Roo 1-G at Ste03 PENALTY ROO delay of game 5 yards to the STE8. Connette B pass attempt failed. Olin A kickoff 56 yards to the STE9, Wort C return 8 yards to the STE17 (Persson M). Ste 1-10 at Ste17 STEELERS drive start at 06:06. Ste 1-10 at Ste17 Bell J rush for no gain to the STE17 (Berg C). Ste 2-10 at Ste17 Bell J rush for 9 yards to the STE26 (Kuikka N;Ayravainen S). Ste 3-1 at Ste26 PENALTY STE false start (Ojansivu N) 5 yards to the STE21. Ste 3-6 at Ste21 Wort C rush for 2 yards to the STE23 (Outinen O). Ste 4-4 at Ste23 Wort C rush for 6 yards to the STE29, 1ST DOWN STE, out-of-bounds (Olin A). Ste 1-10 at Ste29 Peters S rush for loss of 12 yards to the STE17 (Vesterinen E). Ste 2-22 at Ste17 Bell J rush for 1 yard to the STE18 (Vesterinen E;Outinen O). Ste 3-21 at Ste18 Peters S pass complete to Vaisanen J for 6 yards to the STE24 (Lempinen V). Ste 4-15 at Ste24 Peters S punt 31 yards to the ROO45. Roo 1-10 at Roo45 ROOSTERS drive start at 02:05. Roo 1-10 at Roo45 Connette B pass complete to Connette A for 7 yards to the STE48, out-of-bounds (Inkinen S). Roo 2-3 at Ste48 Pajarinen K rush for 3 yards to the STE45, 1ST DOWN ROO, out-of-bounds. Roo 1-10 at Ste45 PENALTY ROO false start (Koskinen T) 5 yards to the 50 yardline. Roo 1-15 at Roo50 Connette B rush for 2 yards to the STE48 (Wort C;Tanninen K). Roo 2-13 at Ste48 Connette B pass incomplete to Linnainmaa K.
Roo 3-13 at Ste48 Connette B pass complete to Connette A for 39 yards to the STE9, 1ST DOWN ROO (Inkinen S). Roo 1-G at Ste09 PENALTY ROO false start (Koskinen T) 5 yards to the STE14. Roo 1-G at Ste14 Start of 2nd quarter, clock 12:00. Roo 1-G at Ste14 Connette B pass complete to Connette A for 14 yards to the STE0, TOUCHDOWN, clock 11:55. Connette B pass attempt to Connette A good. Olin A kickoff 36 yards to the STE29, Borgmann A return -2 yards to the STE27, out-of-bounds. Ste 1-10 at Ste27 STEELERS drive start at 11:53. Ste 1-10 at Ste27 Peters S pass incomplete. Ste 2-10 at Ste27 Peters S rush for loss of 5 yards to the STE22. Ste 3-15 at Ste22 Vaisanen J pass intercepted by Kuikka N at the STE27, Kuikka N return 0 yards to the STE27. Roo 1-10 at Ste27 ROOSTERS drive start at 11:08. Roo 1-10 at Ste27 Connette B pass incomplete to Wasiljeff A (Bell J). Roo 2-10 at Ste27 Connette B rush for loss of 3 yards to the STE30, fumble forced by Vaisanen J, fumble by Connette B recovered by STE Kuosmanen S at STE30. Ste 1-10 at Ste30 STEELERS drive start at 10:59. Ste 1-10 at Ste30 Bell J pass incomplete to Ndongo T.
Ste 2-10 at Ste30 Bell J rush for 10 yards to the STE40, 1ST DOWN STE (Slater C;Kuikka N). Ste 1-10 at Ste40 Bell J rush for 3 yards to the STE43 (Rautiainen J), PENALTY ROO face mask 18 yards to the ROO42, 1ST DOWN STE, NO PLAY. Ste 1-10 at Roo42 Vaisanen J pass incomplete to Ndongo T.
Ste 2-10 at Roo42 Hayden D rush for 6 yards to the ROO36 (Rautiainen J;Ayravainen S). Ste 3-4 at Roo36 Hayden D rush for 1 yard to the ROO35 (Lesonen H;Berg C). Ste 4-3 at Roo35 Vaisanen J pass incomplete to Wort C (Persson M). Roo 1-10 at Roo35 ROOSTERS drive start at 09:09. Roo 1-10 at Roo35 Pajarinen K rush for 8 yards to the ROO43 (Hayden D). Roo 2-2 at Roo43 Timeout STEELERS, clock 08:55. Roo 2-2 at Roo43 Pajarinen K rush for 18 yards to the STE39, 1ST DOWN ROO (Hayden D). Roo 1-10 at Ste39 Connette B pass incomplete to Linnainmaa K.
Roo 2-10 at Ste39 Connette B rush for 27 yards to the STE12, 1ST DOWN ROO, out-of-bounds (Bell J). Roo 1-10 at Ste12 Connette B pass complete to Connette A for 12 yards to the STE0, 1ST DOWN ROO, TOUCHDOWN, clock 07:57. Connette B rush attempt good. Olin A kickoff 52 yards to the STE13, Ndongo T return 22 yards to the STE35 (Linnainmaa K;Redin I). Ste 1-10 at Ste35 STEELERS drive start at 07:47. Ste 1-10 at Ste35 Peters S pass incomplete. Ste 2-10 at Ste35 Peters S pass complete to Jauhiainen J for 65 yards to the ROO0, 1ST DOWN STE, TOUCHDOWN, clock 07:32. Ste 1-G at Ste35 ROO 6 now wearing 7. Ojainvali M kickoff 61 yards to the ROO4, Connette A return 14 yards to the ROO18 (Uotila A). Roo 1-10 at Roo18 ROOSTERS drive start at 07:25. Roo 1-10 at Roo18 Connette B pass complete to Linnainmaa K for 41 yards to the STE41, 1ST DOWN ROO (Pekkarinen I). Roo 1-10 at Ste41 Timeout STEELERS, clock 07:13. Roo 1-10 at Ste41 Connette B pass complete to Connette A for 9 yards to the STE32. Roo 2-1 at Ste32 Pajarinen K rush for 4 yards to the STE28, 1ST DOWN ROO (Bell J). Roo 1-10 at Ste28 Connette B rush for 8 yards to the STE20 (Aspinen M;Hayden D). Roo 2-2 at Ste20 Connette B rush for 5 yards to the STE15, fumble forced by Bell J, fumble by Connette B recovered by STE Wort C at STE24. Ste 1-10 at Ste24 STEELERS drive start at 05:28. Ste 1-10 at Ste24 Bell J rush for 17 yards to the STE41, 1ST DOWN STE, out-of-bounds (Lempinen V). Ste 1-10 at Ste41 Wort C rush for 7 yards to the STE48 (Slater C). Ste 2-3 at Ste48 Peters S pass incomplete. Ste 3-3 at Ste48 Bell J rush for no gain to the STE48 (Ahonen T). Ste 4-3 at Ste48 Peters S rush for loss of 1 yard to the STE47 (Lesonen H;Berg C). Roo 1-10 at Ste47 ROOSTERS drive start at 03:37. Roo 1-10 at Ste47 Connette B pass incomplete to Linnainmaa K (Pekkarinen I). Roo 2-10 at Ste47 Jussila H rush for 6 yards to the STE41 (Hayden D). Roo 3-4 at Ste41 Connette B rush for 3 yards to the STE38, out-of-bounds. Roo 4-1 at Ste38 Connette B rush for 8 yards to the STE30, 1ST DOWN ROO (Aspinen M). Roo 1-10 at Ste30 Connette B pass complete to Linnainmaa K for 30 yards to the STE0, 1ST DOWN ROO, TOUCHDOWN, clock 02:23. Connette B pass attempt to Linnainmaa K good. Olin A kickoff 65 yards to the STE0, touchback. Ste 1-10 at Ste20 STEELERS drive start at 02:23. Ste 1-10 at Ste20 Peters S pass incomplete. Ste 2-10 at Ste20 Peters S pass incomplete to Ndongo T (Lempinen V). Ste 3-10 at Ste20 Bell J rush for 1 yard to the STE21 (Vesterinen E). Ste 4-9 at Ste21 Peters S punt 29 yards to the 50 yardline, Ayravainen S return 0 yards to the 50 yardline (Hayden D). Roo 1-10 at Roo50 ROOSTERS drive start at 01:49. Roo 1-10 at Roo50 Connette B pass complete to Jussila H for 19 yards to the STE31, 1ST DOWN ROO (Hayden D). Roo 1-10 at Ste31 Jussila H rush for no gain to the STE31 (Hayden D;Vilpponen P). Roo 2-10 at Ste31 Connette B pass complete to Connette A for 13 yards to the STE18, 1ST DOWN ROO (Uotila A). Roo 1-10 at Ste18 Connette B pass incomplete. Roo 2-10 at Ste18 Jussila H rush for 1 yard to the STE17 (Hayden D). Roo 3-9 at Ste17 Connette B pass incomplete to Pinta T.
Roo 4-9 at Ste17 Connette B rush for 10 yards to the STE7 (Wort C), PENALTY ROO holding (Vehkomaki S) 11 yards to the STE28, NO PLAY. Roo 4-20 at Ste28 Connette B pass complete to Pajarinen K for loss of 3 yards to the STE31 (Hayden D). Ste 1-10 at Ste31 STEELERS drive start at 00:04. Ste 1-10 at Ste31 Peters S pass incomplete to Vaisanen J (Ayravainen S). Ste 2-10 at Ste31 End of half, clock 00:00. Ste 2-10 at Ste31 Start of 3rd quarter, clock 12:00, STE ball on STE35. Ojainvali M kickoff 47 yards to the ROO18, Connette A return 19 yards to the ROO37 (Tuppurainen T). Roo 1-10 at Roo37 ROOSTERS drive start at 11:53. Roo 1-10 at Roo37 Connette B pass complete to Linnainmaa K for 5 yards to the ROO42 (Pekkarinen I). Roo 2-5 at Roo42 Connette B rush for loss of 3 yards to the ROO39 (Hayden D). Roo 3-8 at Roo39 Connette B rush for 14 yards to the STE47, 1ST DOWN ROO. Roo 1-10 at Ste47 Connette B rush for 15 yards to the STE32, 1ST DOWN ROO (Inkinen S;Hayden D). Roo 1-10 at Ste32 Connette B pass complete to Davis W for 3 yards to the STE29 (Hayden D;Luukkonen K). Roo 2-7 at Ste29 PENALTY ROO false start (Vehkomaki S) 5 yards to the STE34. Roo 2-12 at Ste34 PENALTY STE offside defense (Hovinen S) 6 yards to the STE28. Roo 2-6 at Ste28 Connette B pass incomplete to 86. Roo 3-6 at Ste28 Connette B pass incomplete. Roo 4-6 at Ste28 Connette B rush for loss of 6 yards to the STE34, fumble by Connette B recovered by STE Hayden D at STE34. Ste 1-10 at Ste34 STEELERS drive start at 08:26. Ste 1-10 at Ste34 Bell J rush for 1 yard to the STE35 (Toivonen S). Ste 2-9 at Ste35 Bell J rush for 5 yards to the STE40 (Persson M). Ste 3-4 at Ste40 Peters S pass incomplete to Wort C (Persson M). Ste 4-4 at Ste40 Peters S pass incomplete to Jauhiainen J (Olin A). Roo 1-10 at Ste40 ROOSTERS drive start at 07:04. Roo 1-10 at Ste40 Jussila H rush for 10 yards to the STE30, 1ST DOWN ROO (Aspinen M;Tanninen K). Roo 1-10 at Ste30 Jussila H rush for loss of 4 yards to the STE34 (Ntwa F). Roo 2-14 at Ste34 Jussila H rush for 11 yards to the STE23, out-of-bounds (Aspinen M). Roo 3-3 at Ste23 Connette B rush for 5 yards to the STE18, 1ST DOWN ROO (Makinen J). Roo 1-10 at Ste18 Connette B pass complete to Pinta T for 11 yards to the STE7, 1ST DOWN ROO (Uotila A). Roo 1-G at Ste07 Connette B pass incomplete to Pinta T (Uotila A). Roo 2-G at Ste07 Connette B pass incomplete to Pinta T (Uotila A). Roo 3-G at Ste07 Connette B pass complete to Pinta T for 7 yards to the STE0, TOUCHDOWN, clock 04:55. Roo 1-G at Ste03 PENALTY ROO OO 5 yards to the STE8. Connette B pass attempt to Wasiljeff A good. Olin A kickoff 60 yards to the STE5, Wort C return 8 yards to the STE13 (Slater C). Ste 1-10 at Ste13 STEELERS drive start at 04:46. Ste 1-10 at Ste13 Bell J rush for 9 yards to the STE22 (Toivonen S). Ste 2-1 at Ste22 Bell J rush for no gain to the STE22 (Kuikka N), PENALTY STE holding 11 yards to the STE11, NO PLAY. Ste 2-12 at Ste11 Peters S pass complete to Jauhiainen J for 26 yards to the STE37, 1ST DOWN STE (Olin A). Ste 1-10 at Ste37 Wort C rush for loss of 11 yards to the STE26 (Slater C), PENALTY STE personal foul declined. Ste 2-21 at Ste26 Peters S pass incomplete to Vaisanen J (Ayravainen S). Ste 3-21 at Ste26 Hayden D rush for 4 yards to the STE30 (Outinen O). Ste 4-17 at Ste30 Peters S pass complete to Bell J for 19 yards to the STE49, 1ST DOWN STE, out-of-bounds. Ste 1-10 at Ste49 Bell J rush for 5 yards to the ROO46 (Ayravainen S;Vesterinen E). Ste 2-5 at Roo46 Peters S pass complete to Borgmann A for 1 yard to the ROO45 (Slater C). Ste 3-4 at Roo45 Bell J rush for 10 yards to the ROO35, 1ST DOWN STE (Outinen O). Ste 1-10 at Roo35 Peters S pass incomplete. Ste 2-10 at Roo35 Lindsten V rush for loss of 2 yards to the ROO37 (Kuikka N). Ste 3-12 at Roo37 Start of 4th quarter, clock 12:00. Ste 3-12 at Roo37 Peters S pass intercepted by Slater C at the ROO15, Slater C return 36 yards to the STE49 (Ojansivu N). Roo 1-10 at Ste49 ROOSTERS drive start at 11:47. Roo 1-10 at Ste49 Connette B pass complete to Connette A for 13 yards to the STE36, 1ST DOWN ROO (Wort C). Roo 1-10 at Ste36 Kuronen A rush for 4 yards to the STE32 (Hayden D). Roo 2-6 at Ste32 Connette B pass complete to Wasiljeff A for 9 yards to the STE23, 1ST DOWN ROO (Aspinen M;Inkinen S). Roo 1-10 at Ste23 Connette B pass incomplete to Linnainmaa K.
Roo 2-10 at Ste23 Connette B pass incomplete to Connette A.
Roo 3-10 at Ste23 Connette B pass incomplete to Linnainmaa K (Pekkarinen I), PENALTY ROO pass interference (Linnainmaa K) 15 yards to the STE38, NO PLAY. Roo 3-25 at Ste38 Connette B pass incomplete, PENALTY ROO holding declined. Roo 4-25 at Ste38 Olin A punt 27 yards to the STE11, downed. Ste 1-10 at Ste11 STEELERS drive start at 10:30. Ste 1-10 at Ste11 Wort C rush for 1 yard to the STE12 (Ayravainen S;Lievonen Mi). Ste 2-9 at Ste12 Peters S pass complete to Jauhiainen J for 6 yards to the STE18. Ste 3-3 at Ste18 Wort C rush for 12 yards to the STE30 (Lempinen V), PENALTY STE holding (Bednarczyk B) 9 yards to the STE9, NO PLAY. Ste 3-12 at Ste09 Peters S pass incomplete. Ste 4-12 at Ste09 Peters S punt 33 yards to the STE42, Slater C return 11 yards to the STE31 (Tanninen K;Hayden D). Roo 1-10 at Ste31 ROOSTERS drive start at 08:26. Roo 1-10 at Ste31 Pajarinen K rush for no gain to the STE31 (Makinen J;Tanninen K). Roo 2-10 at Ste31 Pajarinen K rush for 20 yards to the STE11, 1ST DOWN ROO, out-of-bounds (Bell J). Roo 1-10 at Ste11 Pajarinen K rush for 3 yards to the STE8 (Lindqvist J). Roo 2-7 at Ste08 Pajarinen K rush for 1 yard to the STE7 (Bell J). Roo 3-6 at Ste07 Connette B pass incomplete to Wasiljeff A.
Roo 4-6 at Ste07 Connette B pass complete to Linnainmaa K for 7 yards to the STE0, 1ST DOWN ROO, TOUCHDOWN, clock 06:16. Olin A kickoff 40 yards to the STE25, Bell J return 11 yards to the STE36 (Vartiainen A). Ste 1-10 at Ste36 STEELERS drive start at 06:07. Ste 1-10 at Ste36 Bell J rush for loss of 1 yard to the STE35 (Olin A). Ste 2-11 at Ste35 Peters S pass complete to Wort C for 2 yards to the STE37 (Davis W;Toivonen S). Ste 3-9 at Ste37 Peters S pass incomplete. Ste 4-9 at Ste37 PENALTY STE delay of game (Peters S) 5 yards to the STE32. Ste 4-14 at Ste32 Peters S punt 45 yards to the ROO23, Slater C return 12 yards to the ROO35 (Peltonen J-P;Luukkonen K). Roo 1-10 at Roo35 ROOSTERS drive start at 04:20. Roo 1-10 at Roo35 Kuronen A rush for 6 yards to the ROO41 (Makinen J). Roo 2-4 at Roo41 Kuronen A rush for 11 yards to the STE48, 1ST DOWN ROO (Ojala L). Roo 1-10 at Ste48 Jussila H rush for 12 yards to the STE36, 1ST DOWN ROO (Ojala L;Hayden D). Roo 1-10 at Ste36 Connette B pass complete to Connette A for 16 yards to the STE20, 1ST DOWN ROO (Hartikainen T). Roo 1-10 at Ste20 Daifi M rush for 6 yards to the STE14, out-of-bounds (Ojainvali M). Roo 2-4 at Ste14 Lahtinen A rush for 2 yards to the STE12 (Hayden D). Roo 3-2 at Ste12 Lahtinen A rush for 3 yards to the STE9, 1ST DOWN ROO (Lindqvist J). Roo 1-G at Ste09 Connette B rush for loss of 1 yard to the STE10. Roo 2-G at Ste10 Connette B rush for loss of 1 yard to the STE11. Roo 3-G at Ste11 End of game, clock 00:00. Tänään koittaa se päivä, kun Kanadan suurlähetystön aikanaan lahjoittamasta Vaahteramaljasta pelataan 39:nnen kerran. Kuusi kertaa putkeen maljan vienyt Roosters lähtee otteluun ennakkosuosikkina huikean kauden nousijajoukkueena pelannutta Kuopion Steelersia vastaan. Roostersilla on tilillään 20 Suomen mestaruutta. Joukkue pyrkii tekemään historiaa Telia 5G-areenalla, sillä yksikään joukkue ei ole voittanut seitsemää perättäistä mestaruutta suomijefun historian aikana. Finaalipaikka on Roostersille seurahistorian 24:s. Steelers pelaa loppuottelussa toista vuotta putkeen. Vuosi sitten Steelers nousi Vaahteraliigaan voittamalla ykkösen finaalin Spagettimaljan. 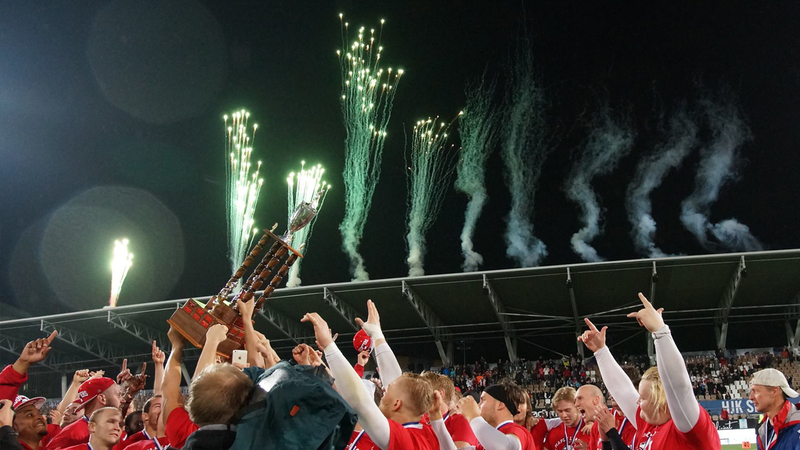 Roosters voitti runkosarjassa kaikki ottelunsa. Steelersin saldo oli kahdeksan voittoa ja kaksi tappiota, molemmat Roostersille. Välierissä Roosters kaatoi Butchersin 47-7, Steelers Royalsin 34-26. Roostersin hyökkäys on takonut tällä kaudella pisteitä liki ennätystahtiin (52,6 per peli) huolimatta siitä, että helsinkiläiset ovat ottaneet aloitusmiehistöään useassa ottelussa sivuun jo kahden neljänneksen jälkeen. Steelersin hyökkäys on ollut liigan toiseksi tehokkain, mutta suurin haaste tulee kuopiolaisten puolustukselle, joka on useissa tilastokategorioissa liigan häntäpäätä. Roosters vei joukkueiden molemmat runkosarjakohtaamiset nimiinsä ja teki molemmissa otteluissa yli 50 pistettä. – Kuopion puolustus on pelannut suunnilleen samalla systeemillä pelistä toiseen koordinaattorivaihdoksen jälkeen. Tuskin he viikossa asioita niin paljon muuttavat, joten valmistaudumme siihen mitä olemme nähneet. Jos jotain uutta ilmenee pelin aikana, meidän pitää olla hereillä sivurajalla. Valmistautuminen Kuopiota vastaan alkoi heti, kun varmistui, että he tulevat meitä vastaan, Roostersin hyökkäyksen koordinaattori Mikko Koikkalainen sanoo seuran otteluennakossa. Roostersin pelinrakentaja Brandon Connette pelasi toisen vaahteraliigakautensa huikeilla tehoilla: Hän heitti runkosarjassa 43 touchdownia ja vain kaksi syötönkatkoa. Heitoista onnistui 64,5 prosenttia. Myös toista kauttaan Suomessa pelaava Steelersin Seth Peters pelasi myös vahvan kauden: 32 touchdownia ja kolme syötönkatkoa. Molemmilla pelinrakentajilla on laaja arsenaali heiton kohteita käytössään, ja lisäksi molempien joukkueiden juoksupeli on ollut vahvaa läpi kauden. – He osaavat säädellä hyökkäyspelin rytmiä hyvin. He voivat pelata nopean tai rauhallisen kautta, miesten maajoukkueen päävalmentaja Tuomas Heikkinen sanoo kovaa tempoa pitäneestä Steelers-hyökkäyksestä. Roostersin tukimies Ilya Redin kertoo seuran otteluennakossa ottelun jäävän hänen pitkän uransa viimeiseksi. Myös maajoukkueen kulmakiviin lukeutuva puolustuksen linjamies Okko Outinen pohtii samaa. – Niin, kauden vai uran viimeinen peli. Mahdotonta vielä sanoa, mutta erittäin suurella todennäköisyydellä haikeat jäähyväiset ainakin Suomen kentille taidetaan jättää lauantaina. Ilmatieteen laitoksen sääennuste lupaa Helsinkiin lauantai-illaksi sateista säätä. Tapahtumat Telia 5G -areenan liepeillä starttaavat jo kello 12. Stadionin kupeessa Urheilukadulla tarjolla on ruokaa ja erilaista ohjelmaa ja tapahtumia koko iltapäivän. Lue lisää tästä. Ottelu on myös Veikkauksen vedonlyöntikohteena. Kertoimenlaskijat pitävät Roostersia jättimäisenä ennakkosuosikkina, sillä runkosarjan ykkösen kerroin on 1,02, Steelersin 15. Yli 64,5 pisteen yhteispistemäärän kerroin on 1,95. Mikäli pistemäärän veikataan jäävän tuon alle, kerroin on 1,75. Ottelu on lisäksi päivän trion sekä livevedon kohteena.